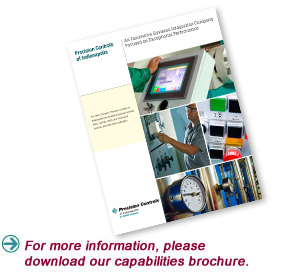 Precision Controls of Indianapolis provides unique solutions for your control and service challenges. Our prime objective is to earn your confidence and respect by providing exceptional performance and products through our services. And we continue to add value through ongoing maintenance and support services. We deliver facility automation design, installation, and support for every imaginable building system, and our web-based technologies give owners global access to all building performance information. We bring safety and comfort to occupants while optimizing energy management. Our Intelligent Automation (I/A) by Schneider Electric is just the beginning. Precision’s Control Systems Team supports all of your temperature control, automation, and building integration needs. We provide our customers with process control systems, systems integration, and SCADA (Supervisory Control and Data Acquisition) systems engineered to fit their needs. Precision Controls has provided quality systems and services in the process control field since 1992, and we bring those years of experience and knowledge to every project. We provide repair, replacement, and preventive maintenance service for all types of heating, ventilating, and air conditioning equipment. Our facility maintenance service plans are individually customized to meet your specific needs and to keep your HVAC system running at full steam.